Why do so many homeowners bury one of their basement’s most valuable nuggets—the concrete floor? Why do they assume that hiding the concrete under carpeting or other floor coverings is the best way to strike it rich in terms of value and resale potential? It's time to straighten these homeowners out and bust some of the common myths about the perceived disadvantages of concrete floors. 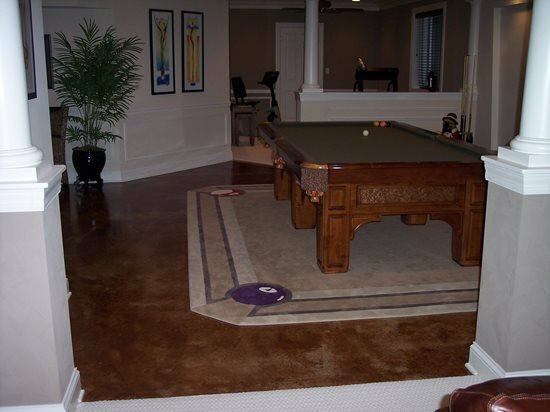 In fact, assuming that the basement and floor are structurally sound, enhancing the concrete rather than covering it up is fast becoming the gold standard in basement floor treatments, with benefits that extend well beyond aesthetics. "This is rarely true in properly constructed newer homes because they are better insulated than older homes and today's building codes typically require installation of a vapor barrier under the slab to block moisture migration," according to Jerry Kline and Don Henson of Kline Construction, Elgin, Ill., a firm that specializes in stamping, staining, and overlaying of both interior and exterior concrete slabs. They are seeing a growing trend in decorative concrete interior floors, particularly in upscale homes. To keep concrete floors warmer underfoot in winter, homeowners can install in-floor radiant heat before the slab is poured. Basements are one of the most popular areas to install these systems, which circulate heated water through polyethylene tubing. 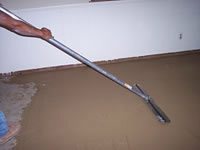 Some systems can also be retrofit into existing basements by covering the tubing with a self-leveling overlay. 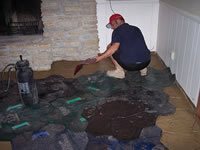 Thinking of installing carpeting over an uninsulated or unheated concrete slab? Don't do it, says the Minnesota Department of Commerce Energy Information Center, because the carpet will be susceptible to mold and mildew. The basement floor is generally cooler than the basement air temperature, and installing carpet only lowers the temperature even more. If the basement humidity is high enough, the temperature of the floor under a carpet may, in certain areas, fall below the dew point of the air. Under this condition, a small amount of moisture will accumulate under the carpet, making conditions right for mold growth. The moisture formation may be so slight that you won't see it from the top of the carpet. If the basement floor is already insulated or has under-floor heat, then carpeting or area rugs may work. Colors on Concrete in Upland, CA. "Not so," says Henson, "unless the cracks are serious and due to structural issues." In fact, many of Kline Construction's customers like the rustic, fractured look that can be achieved by staining the floor and leaving minor random cracks exposed. If the cracks are perceived as an eyesore, a polymer-modified cement-based overlay is an easy solution for hiding them and can accept a wide array of decorative treatments, including staining, stamping, and stenciling (see Myth #7). 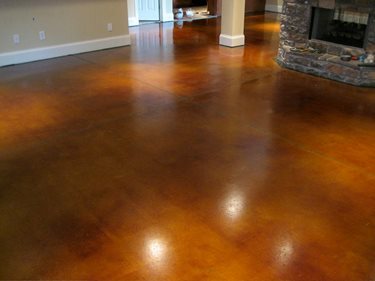 As the photos here show, concrete stained a rich, earthy tone instantly warms up a room and stands out as one of the basements most attractive features. 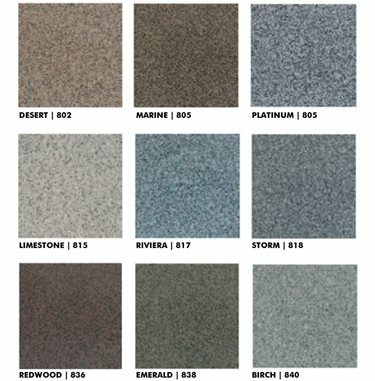 With decorative concrete, there's also no risk of chemical emissions, like there are from new carpeting. These emissions can be especially hazardous in basement spaces that aren't well ventilated. Carpets also are a breeding ground for dust mites and other allergens (see Mayo Clinic's recommendations for allergy-proofing a basement and other rooms in the house). Hardwood flooring isn't a practical covering for most basement slabs because of the potential exposure to moisture and humidity. The solution: Simply apply an overlay to the concrete floor and stamp it with a wood-grain pattern. Kline Construction in Elgin, IL produced this miraculous hardwood floor impersonation using stamps from Butterfield Color. It won't hurt, but radon, if present in the soil surrounding the basement, can still infiltrate into the home through cracks in the foundation, according to the Environmental Protection Agency. And sealing alone won't lower radon levels significantly or consistently. Henson points out that for new construction, building codes in his area require radon testing. Basement slabs in newer homes may also require a vapor barrier, which can help to block radon infiltration. In existing homes, a radon test should be taken before starting a basement renovation project. Generally, it's less expensive to install a radon-reduction system during renovations than afterwards. The EPA publication Home Buyers and Sellers Guide to Radon offers additional guidelines for radon testing and for lowering radon levels in the home. This is possibly the biggest myth of all. No flooring material offers more decorative versatility than concrete. 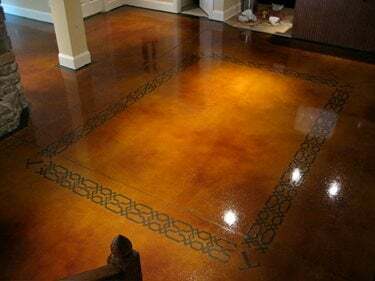 A few of the options particularly well-suited for basement floors include stampable and self-leveling overlays, chemical stains, epoxy coatings, paints, dyes, and stenciling. 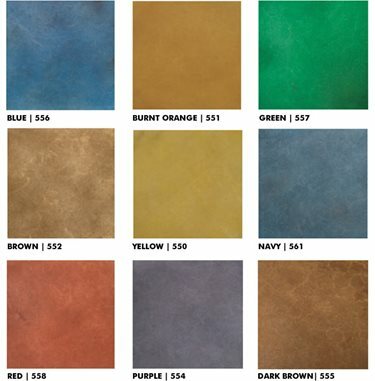 What's more, these treatments can be combined to create one-of-a-kind decorative finishes to suit unique basement design schemes. Stencil a colorful border or faux area rug on the floor using Modellos, adhesive-backed masking patterns available in more than a thousand standard and custom designs. Applying color with chemical stains or dyes, either before or after the Modello is removed, permits an infinite array of special effects. Install a stamped overlay. Kline Construction says it's possible to resurface most existing basement floors and stamp them to look like slate, stone, and even a hardwood floor. Kline uses a polymer-modified stampable overlay, coloring agents, and stamping tools supplied by Butterfield Color. 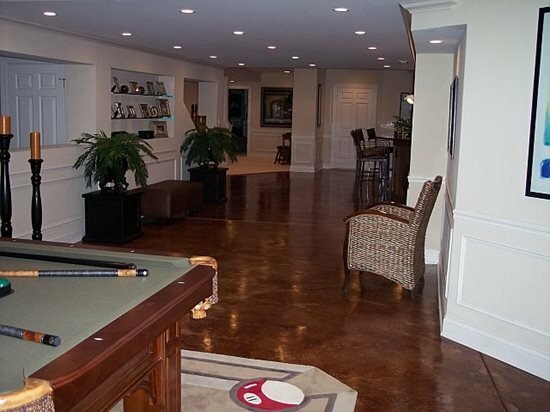 Basement floor paint: Paint the concrete floor to mimic marble or tile. 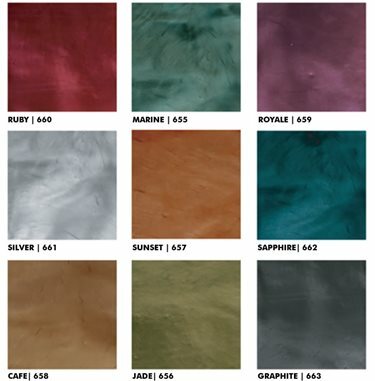 Use multiple paint colors for contrast or accenting and faux finishing techniques, such as sponging and splattering, to create textural interest. Stain the floor to achieve rich, variegated layers of translucent color. Henson says that using three or four different stain colors will add drama and produce three-dimensional effects. about 3/8 inch, is imprinted with a fieldstone pattern to accent a rustic stone fireplace. Kline Construction in Elgin, IL. 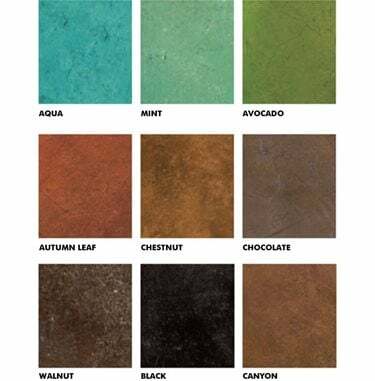 All of these floor finishes impart beauty and originality without diminishing concrete's most valuable assets: economy, longevity, and practicality. But a word of caution: If the basement has poor ventilation, avoid the use of solvent-based products, which can emit hazardous fumes. Many concrete stains, dyes, paints, sealers, and epoxies are available in water-based, solvent-free formulations.